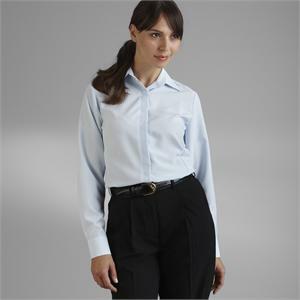 Moisture wicking fabric with a soil release finish that helps wash away stains. Resists wrinkles and static. Modifiable collar can be worn with or without neckwear. Hidden button placket. Dyed to match buttons. Adjustable button cuffs. Front and back princess seams, front bust darts, and shirt tail hem. 2 extra buttons included. 100% polyester.